What's been happening to the tax gap? 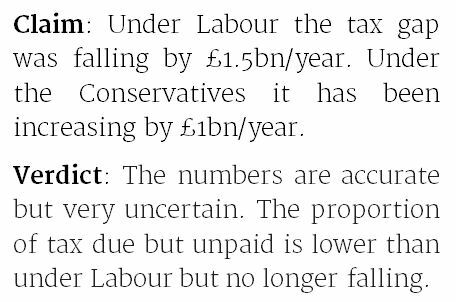 Under Labour the tax gap was falling by £1.5bn/year. Under the Conservatives it has been increasing by £1bn/year. The numbers are accurate but very uncertain. The proportion of tax due but unpaid is lower under Labour but no longer falling. 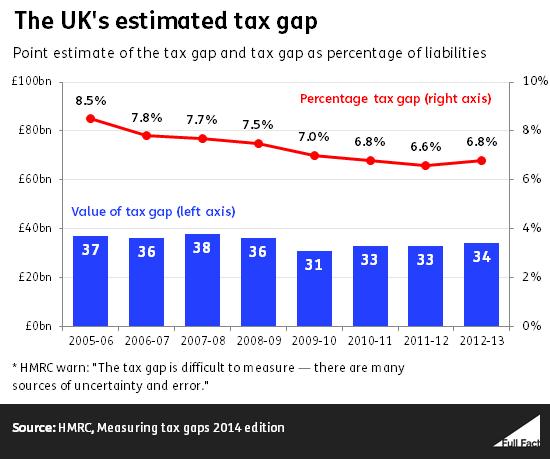 HMRC say: "The tax gap stayed fairly flat between 2005/06 and 2008/09 at around £37 billion, fell to £31 billion in 2009/10, before rising to £34 billion in 2012/13". The 'tax gap' is the difference between the amount of tax that should in theory be collected by HMRC, against what is actually collected. HMRC also say: "Most of the estimates for 2012-13 are provisional and are projected from an earlier year's actual data using the trend in liabilities." There are no more recent estimates than 2012/13. It's therefore hard to be confident that the numbers tell us much about the government's performance. Because the total amount of tax that's liable is going up, simply looking at the amount of the tax gap might not be helpful. The estimates for the proportion of tax not collected under the first three years of this government are 6.8%, 6.6%, and 6.8%—lower than at any point under the previous government, but not falling in the same way. Measuring the amount of tax which goes uncollected is notoriously difficult, and given the uncertainty behind the figures, this might not even be a genuine rise (or a genuine fall). To make these estimates, HMRC has to make lots of assumptions about the tax it's owed, such as working out how many traders are taking cash-in-hand payments and not declaring their full income, as well as dealing with inevitable errors people make on their tax returns. HMRC suggests for example that the tax gap from Self Assessment (excluding large partnerships) could be anywhere between £8.8 billion and £1.7 billion. So a difference of £1-1.5 billion across the annual estimates isn't necessarily all that meaningful. This means that it's best to look at the tax gap statistics as an indicator of long-term performance, rather than of short-term comparisons. But HMRC's admittedly uncertain figures aren't the only ones available. Tax Research UK, in a report for the Public and Commercial Services Union, estimates the tax gap at £120 billion, that's more than three times HMRC's estimate. Updated 13 April 2015 - we added a reference to the alternative figures from Tax Research UK. Stamp duty: a drag on the housing market? Are women paying 60% less income tax than men? Is David Cameron 'writing a cheque' worth £40,000 for every UK millionaire?